Re:Center is a creative placemaking initiative driven by local citizens and anchored in Chicago’s neighborhoods. 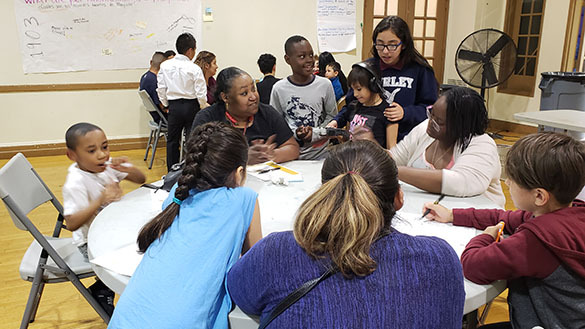 From 2015-2020, the Chicago Park District’s fifteen Cultural Centers are collaborating with surrounding communities to re-imagine cultural priorities and programming that speak to the interests of each neighborhood across Chicago’s North, West, and South sides. Each year, three Cultural Centers are activated with the Re:Center process followed by a year with an artist in residence and the development of a cultural committee to continue working on achieving the unique cultural priorities identified at the start of the process. In this model, community members, artists, and park staff work together to envision Chicagoans as sustained cultural stewards of our public parks. Partially funded by NEA Our Town and in partnership with Lookingglass Theater, Re:Center’s cultural stewardship training program supports communities with cultural programming resources and skill sets in relationship building, program & event planning, problem-solving, and learning to appreciate process as a valuable tool in creating long-term solutions that benefit parks.